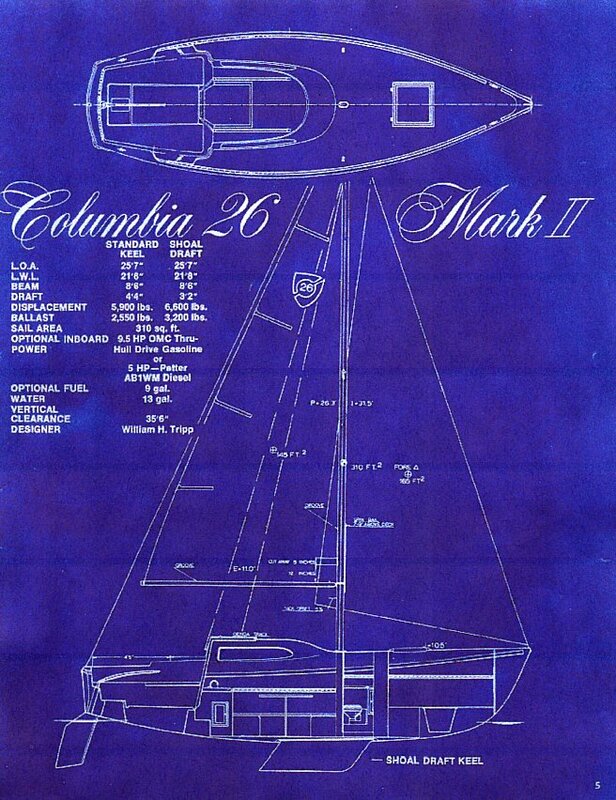 The Columbia 26 Mk II replaced the original 26 in the Columbia model line. According to an article in Practical Sailor (Aug. 1, 1984) production started in 1969 and ended in 1977 after 950 copies were produced. This is one of the Bill Tripp "bubble top" designs. and the Col 26 MkII email list at Yahoo. One owners thoughts and upgrades. Length Overall:   25' 7"             25' 7"
Length Waterline:   21' 8"             21' 8"
Beam:    8' 6"              8' 6"
Draft:    4' 4"              3' 2"
Displacement:  5900 lbs. *         6600 lbs. Ballast (lead):  2500 lbs. 3200 lbs. According to Blair Arden, original running rigging lengths are as follows. These lengths were for lines that ended on the mast. If yours are led back, be sure to add that distance also. Mounting a permanent fuel tank under the cockpit sole. Early C-26 MkII showing full keel. Later C-26 MkII showing optional shoal keel. * Blair Arden writes: The early brochures listed it as 5000 Lb. In late '70 their literature started saying 5900 Lb. There appear to have been no design changes but rather a more accurate listing of the specs. All of the 1969 boats in the Detroit area weigh over 5900 Lb. Mine weighs 6230 Lb. Sometime in early 1970 they must have weighed a couple of them and realized they were heavier than they had been designed to be. 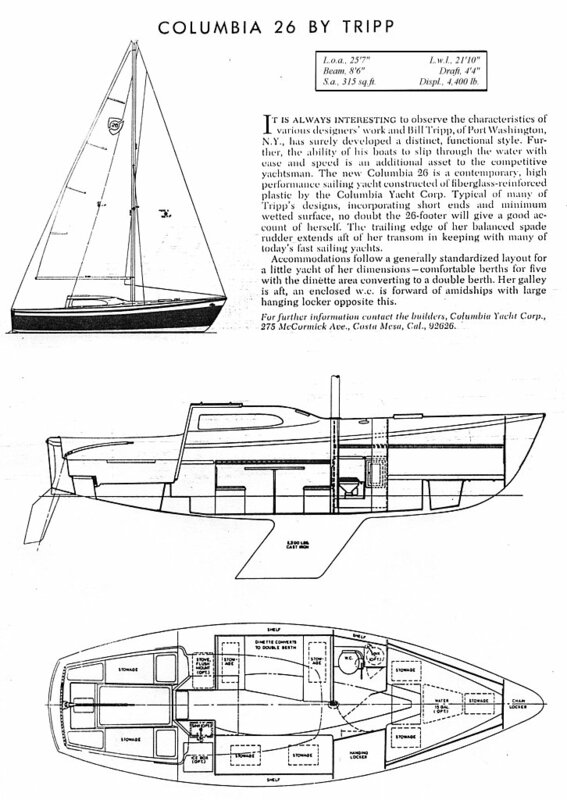 In 1969 the basic boat sold for $5995. All rig dimensions were the same! The racing rig had double lowers, with the normal rig having single lowers. There was some confusion as to the E dimension because some places listed ft-in, and some listed ft-decimal ft. The accepted dimensions are I-31.5, J-10.5, P-26.3, & E-11.0. I race my boat about 4 days a week. There are about 5 racing in this area, and we get together for a 1-design regatta every fall. When I started racing in 1981 my PHRF was 228. Due mostly to my success, the current local rating is 219. An inboard boat has a 6 second credit. The national average appears to be between 225 and 228. I recently purchased a 1972 Columbia 26 that was up on a cradle for the last 4 seasons. It was sold to me as a 26" Mk II, but after looking at original brochures I realized it was probably the cheaper model, the Columbia 26K or was it? The plate on the boat says" Model C-27 Serial # 1516. Was there a model C-27 or is it really a 26'? 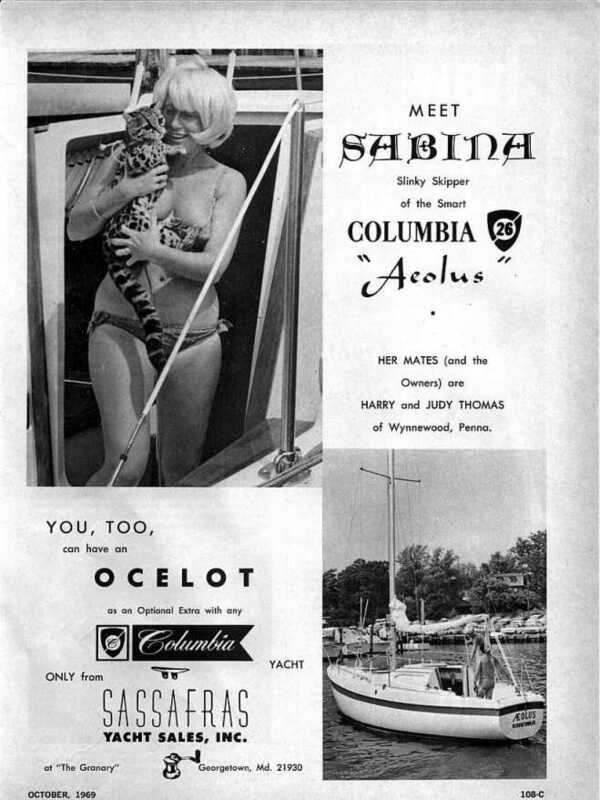 Columbia made three 26 ft. models. The first was the Columbia 26 and it was given the model code C26. I think that when they replaced this model with the 26 MkII they just used the next closest number: C27. Columbia did the same thing with the three concurrent 24 ft. models and the two concurrent 29 ft. models. 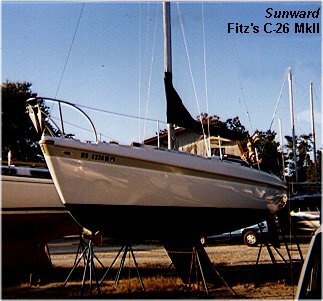 When the Mk II was introduced in 1969 her "sailaway" price with mainsail and jib but without a motor was $5995, an "introductory price" (six months later it was up $500). A motor, shipping, commissioning, and the rest needed to actually sail the boat ran the initial tab to about $7200. In 1984, prices for used 1969 boats are running over $10,000 for a reasonably well equipped and maintained Mk II, with a number being advertised at close to $15,000, overpriced unless in heirloom condition. By 1973, in the midst of the production run, the base price had risen to $7500, about $9000 realistically equipped, and these boats now get closer to $12,000 on the used market. We found one 1972 Mk II selling for close to $14,000 in "immaculate condition" with a new outboard motor. In the last year of production, 1976-1977, the base price for what by then was called the Columbia 26K (to differentiate her from the completely new trailerable Columbia 26T being introduced) ran nearly $14,000, $2000 more all-up. Significantly the current price for these boarts is about $15,000 and up for boats in good condition. Thus, the price for older Mk IIs is much closer to that of newer boats than might be expected, a testament of sorts to the original design and construction of the boats. And finally, another C-26 MkII owner weighs in. I'm a sucker for any boat rescued and returned to the sea. Well, after what we assume was a span of over a decade, our little C-26 mkII finally returned to the sailing world and she did herself proud. Lil Repo left the dock on Sunday, April 5 in a 15 knot breeze from the north. Her old 10hp Chrysler putted her down the river at a steady 4.5 kts. Once out of the congestion of the river traffic, full main was set as was her 150 genny. Banging the wind on her nose, she moaned, stretched her rigging, heeled over about 20 and took off. 2-4 foot seas made her move like a race horse. She kept at a steady 6.5kts with an occ. 7 kt bounce. The 38 foot Endeavor came about in front of Lil Repo, and with a quick tack, Lil Repo came about and raced after the Endeavor. While she didn't beat the far bigger boat, she held her own.